Dr. John Dee (1527-1609)--arguably the most famous of the Elizabethan magicians--was a visionary who straddled the worlds of science and magic. Court astrologer to Elizabeth I, he devoted much of his life to the study of alchemy, divination and Hermetic philosophy. Dee considered all his activities to be different facets of the same quest for an understanding of the divine forms he saw as underlying the visible world, and which showed themselves as oracles--words of wisdom from angelic sources. 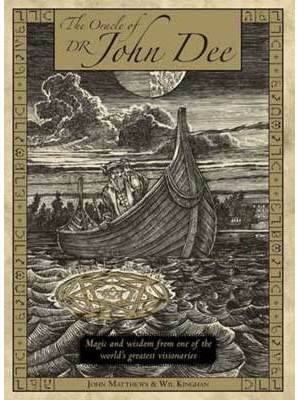 Now best-selling author John Matthews and award-winning artists Wil Kinghan have transformed Dee's studies into The Oracle of Dr. John Dee. Drawing together the interrelated aspects of Dee's work, this oracle offers guidance on key life areas in your own quest or life journey. Based on Dee's own Golden Talisman (currently held in the British Museum), the oracle is governed by the Four Towers of the talisman on which the cards are laid, each representing one of four key divisions of life: health, love, work and intention. Each tower is ruled over by a mighty archangel, who brings the appropriate wisdom, understanding, healing or insight to the issue at hand, helping you to find the way through the storms of life offering strength, support and inspiration.